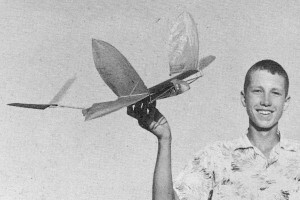 Wing-flapping ornithopter established duration rec­ord of 2 minutes, 58.6 seconds. Tough type to operate. Free flight endurance job is canard, flies with stabilizer forward. Radical departure from conventional types. All-balsa "chuck" glider is given away by gas stations. Fellow above is Joe Bilgri, current International indoor microfilm model champ. 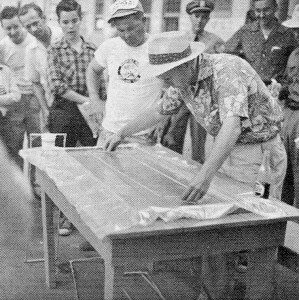 Joe is lifting a sheet of the film from a tray of water in which it is formed (surface tension spreads thin a dope-like mixture poured on its surface). Once started into more advanced model building most modelers seem to find one specialty or another to their particular liking. The choice is usually between the two general types: free flight and control line. Radio control, the ultra-advanced phase of all modeling, will be discussed later. Within both free flight and control line there are numerous subdivisions each with its particular appeal for both sport and contest flying. Free flight types include: Towline gliders, hand launched gliders, rubber-powered, conventional tractor, helicopters, ornithopters and autogiros, Rocket (Jetex) powered, gas engine powered with various engine classes and, until recently, payload and cargo. In free flight flying the object is endurance. Stated simply the idea is to climb the highest and glide the longest. In a contest the model is flying against the stop watch. each model being flown and timed separately rather than in groups. Duration times are then compared at end of flying session to determine the winner. Free flight model flying requires a wide open area at least bigger than two football fields, a small airport being most desirable. Rules and regulations governing model and engine size, limited engine run, and flight duration are applied to the various contest model types listed above. 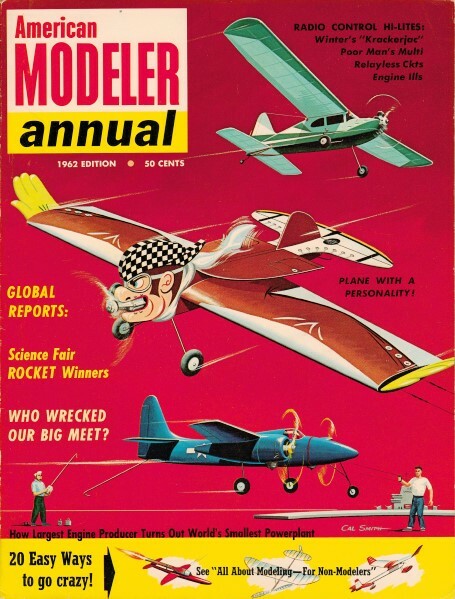 The governing body establishing these rules and overseeing model competition is the A.M.A.-Academy of' Model Aeronautics -1025 Connecticut Ave., N.W., Washington 6, D. C.
A complete run-down of regulations is beyond the scope of this article. The information is contained in the "AMA Model Aircraft Regulations" booklet obtainable from the organization. Of course, not all flying is in contests, but models designed for top contest performance set the pace and pattern for most of the kits and magazine plans available to the modeler. These models serve as sport flyers as well. Many, many modelers never tackle competition, finding Sunday afternoon flying sport more to their liking. TOWLINE GLIDERS - Advanced cousins of our little friend the chuck glider, towline gliders are the soaring hawks of modeldom. Designs range in size from 30" span sport models to big 6' and over Nordic A-2 contest types flown under International competition rules. All have built-up balsa construction and are covered with tissue or lightweight fabric. Structures are light (yet strong) to gain maximum gliding and soaring performance. 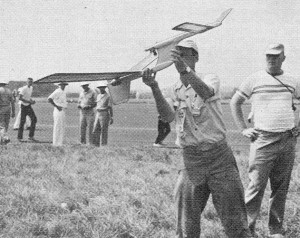 Towline gliders, as the name implies, are towed aloft with a long length of line from a standing start. Nordic rules limit length to 164' maximum. Shorter lines are also used, down to 25' for sport towliners. Two modelers must work together in launching a tow-liner. One holds the glider, the other the towline. The line is stretched up-wind from the model. One launcher runs with the towline, another releases the glider. As towing speed picks up the gliders will climb steeply. When maximum altitude is reached the towline releases from model and it then goes into a prolonged glide. Model is trimmed to climb straight away but glide in circles. Several systems such as auto-rudders are used to maintain straight climb. The object of circling glide trim is to take advantages of any thermals (rising air currents) to prolong duration of flight. The circling also helps model stay closer to launching area rather than gliding great distances downwind. Towline glider flight is by far the most graceful to watch, and high performance designs encountering good thermals will soar to 1,000' altitudes and cover miles of countryside. Towline glider flying requires considerable open field area and modelers who don't mind cross-country running. Modern towliners have such good soaring performance that gadgets are in-stalled on the model to limit flight to a few minutes and to bring model down rapidly but without damage when the time limit is reached. This gadget is the "dethermalizer" which uses a slow burning fuse (test-timed beforehand) to burn through thin rubber' bands holding flying surfaces in place. The most common type is the "pop-up stabilizer." The Nordic A-1 gliders are limited to a maximum 279 square inches of wing and stab surface area and minimum weight of 5.08 ounces. Nordic A-2's limitations are 495.9 to 526.9 sq. in. area and 14.46 ounces weight. In addition to the several built-up sport towliners available that do not fit any particular contest category there is another member of the glider family used in competition. 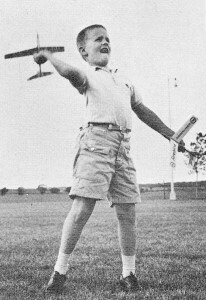 There is one class for hand-launched gliders with surface area limitations of 30 to 130 sq. in. This type of glider is all balsa sheet construction and surfaces are permanently cemented together. Wing spans range from about 15" to 20". Launch is strictly by arm power and although short 15 to 30 second flights are the rule in calm air, thermal activity will put these small gliders right up beside the towliners with flights of several minutes duration resulting. "O.O.S." out-of-sight-flights are not uncommon on a hot summer day.